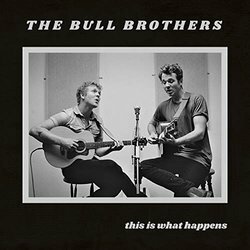 An EP released earlier this year, London-based siblings, Sam and Tom Bull undertook writing duties at the Bakery Studios in Nashville, with Paul Ebersold and Sadler Vaden (the guitar player for Jason Isbell’s band, the 400 Unit), before recording took place at Urchin studios in Hackney. The stand out song on the EP is probably ‘Song For Bob Dylan.’ Somewhat resonant of Bon Iver in its vocal stylings, it glides in on acoustic guitar, over which the brothers’ feathered harmonies implore a “little one” to go to sleep. The sound throughout the EP is largely folk-led with some minor electronic accompaniment, although the title track ‘This Is What Happens,’ benefits from a more direct approach – its imploring vocal arrangement very much to the fore, while there’s a melancholic undertow to the song. It will be interesting to see and hear how they develop their songwriting and sound in the months ahead.